The new Mazda CX-9 is a technology packed and popular full-size SUV. This vehicle has third row SUV capability, which allows it to accommodate more people and cargo than many other vehicles in the same class. In addition, the 2019 CX-9 provides drivers and passengers alike with many eminently useful technology tools. These technological comforts include multi zone climate control capability, pushbutton controls, and driver assistance systems. Mazda's new version of the CX-9 is a large vehicle, but that doesn't stop it from providing each and every passenger with robust personal comfort systems. Key to this effort is the CX-9 30 climate control system that allows passengers in every corner to receive as much hot or cold air as is necessary. Plus, this iconic SUV also uses high-efficiency pollen filters to remove harmful contaminants from the outside air. The new CX-9 is a large vehicle but it makes life easier for drivers and passengers with a number of pushbutton systems. 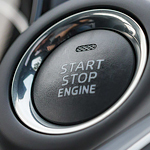 For example, drivers will appreciate the push start capability that does away with the need for keys. Some drivers may conclude that so large a vehicle surely needs robust driver assistance systems in place, and they would be correct. The new Mazda CX-9 indeed provides many driver backup systems that encompass such useful services as Smart City Brake Support, Roll Stability Control, Rearview cameras, and the specialized engine immobilizer anti theft system. This latter technology can completely shut down the CX-9 motor if and when nefarious individuals attempt to break-in.